as every reunion is a type of heaven. Sunsets are special, just like sunrises. I have been blessed to witness both in my yatras and each time, the feeling has been beyond ordinary comprehension. Even accentuated significantly… especially if the same were to occur near a water body. 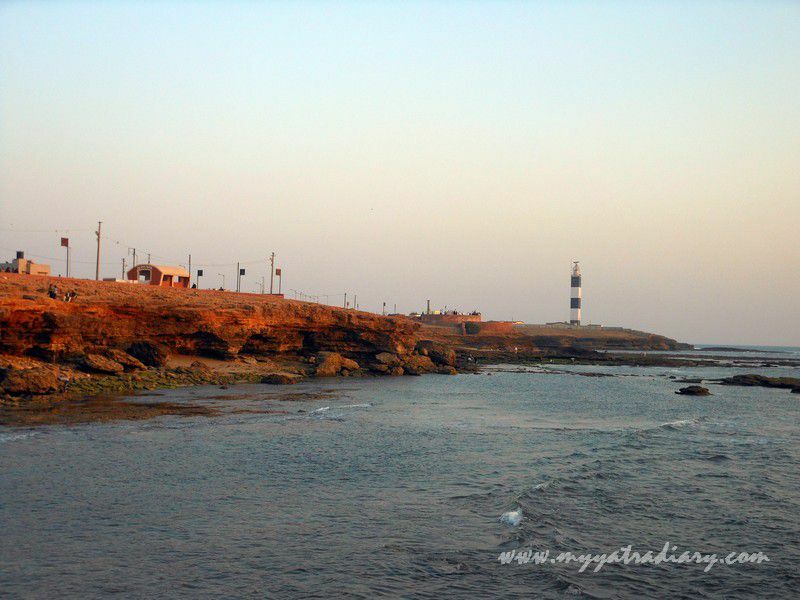 Come Along With Me... To The Bhadkeshwar Mahadev Temple in Dwarka! 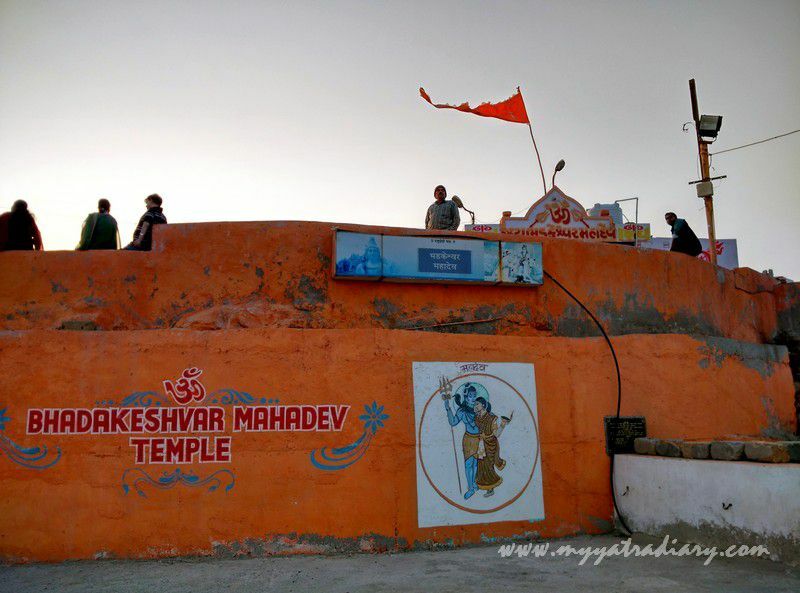 In the wake of the otherwise huge Dwarkadhish temple overlooking the town, Bhadkeshwar temple dedicated to Lord Shiva (or Lord Mahadev) feels tiny. 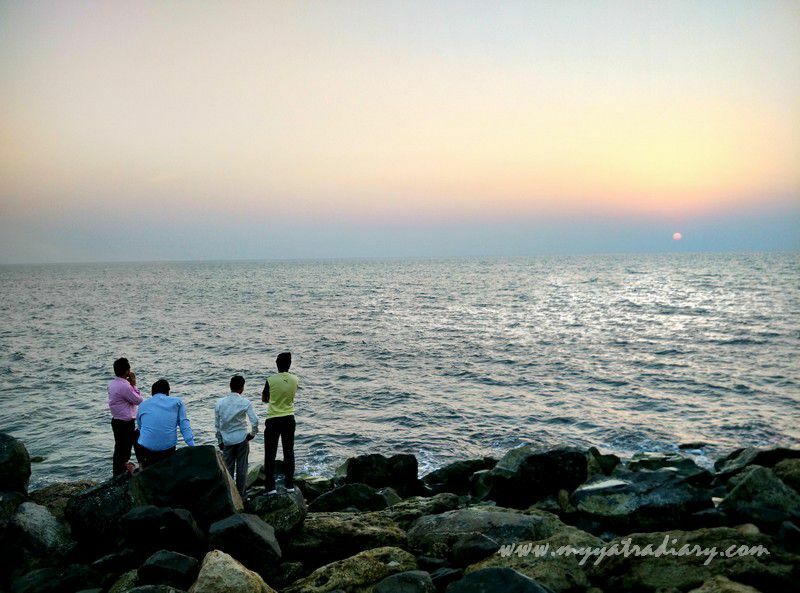 It’s a wonderfully scenic place to catch a sunrise / sunset after a tiring day of exploring the town of Dwarka and Bet Dwarka. 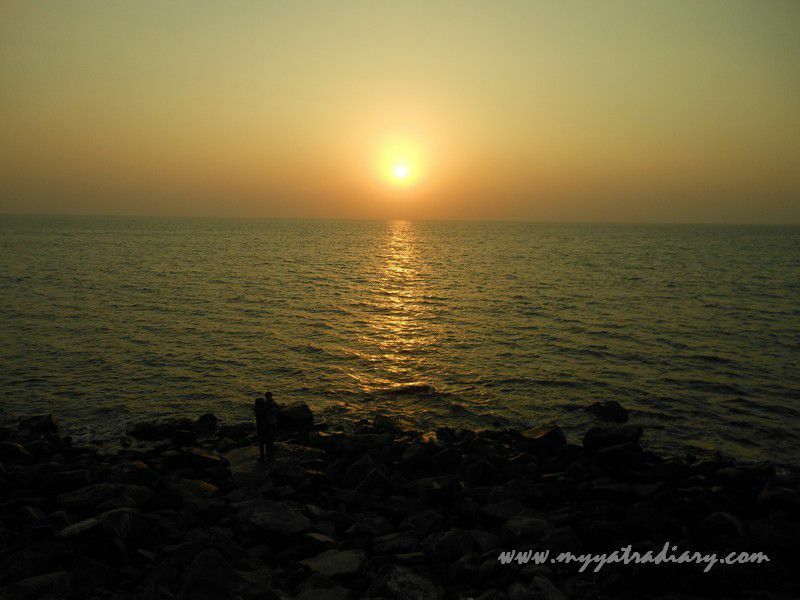 Hence, it is also sometimes referred to as the sunset point. Old Shiva Temple in Dwarka. 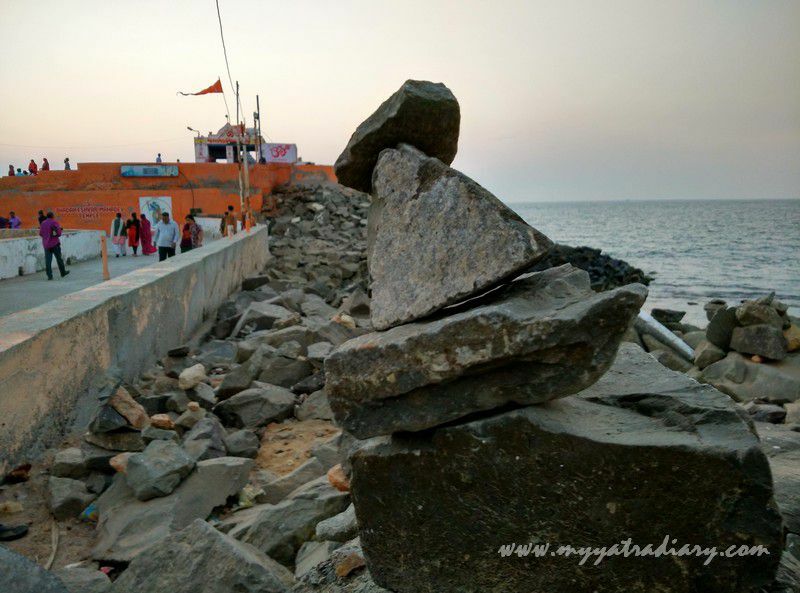 When I reach the place, there is still some time for the sunset, leaving me enough time to observe the area and pay my respects to Lord Shiva in the temple. The path to the temple is lined with a number of souvenir hawkers and food vendors. So there is a chana jor garam wala, the nariyal paani wala and the bhutta wala adding their respective flavors to the chirpy atmosphere. Oh wait! 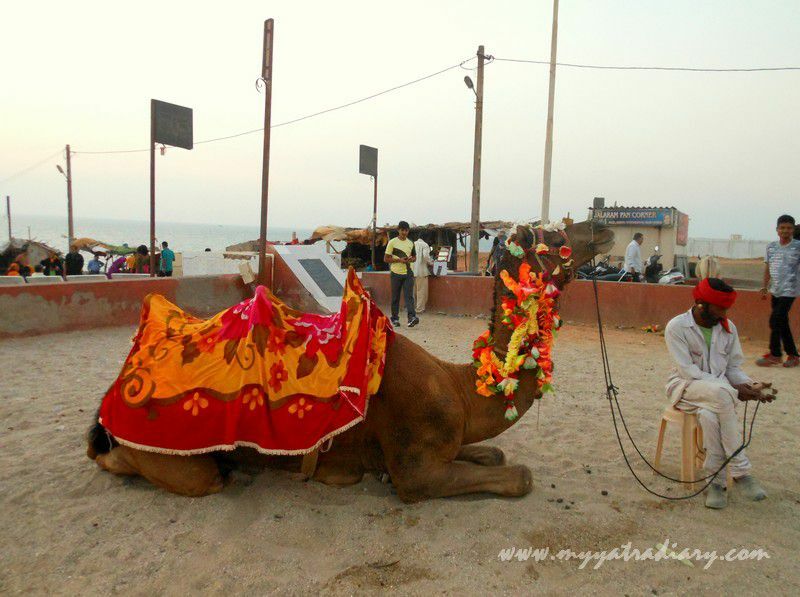 There sits a gorgeous camel too, gaily decked up in colorful dress and traditional ornaments, waiting for someone that can be taken on a ride. All this can be seen, on a rocky outcrop, crowded with pilgrims, filled with incessant murmuring and chatter, looking out to the sea. The outcrop extends into the temple area which can be accessed by a narrow bridge and a few steps opening into a circular jagged rock island, standing a few meters above the sea level. 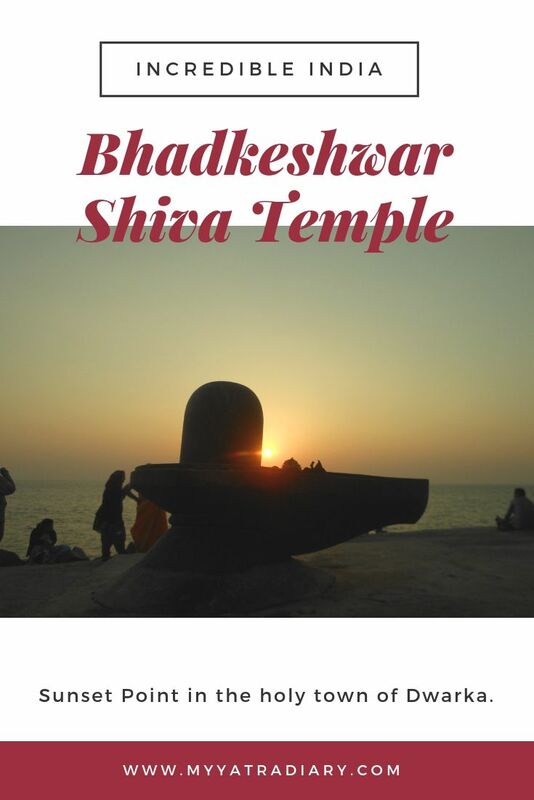 In the center of it, is the stone temple housing a small Shiva lingam known by the name of Chandra-Mouliswar. 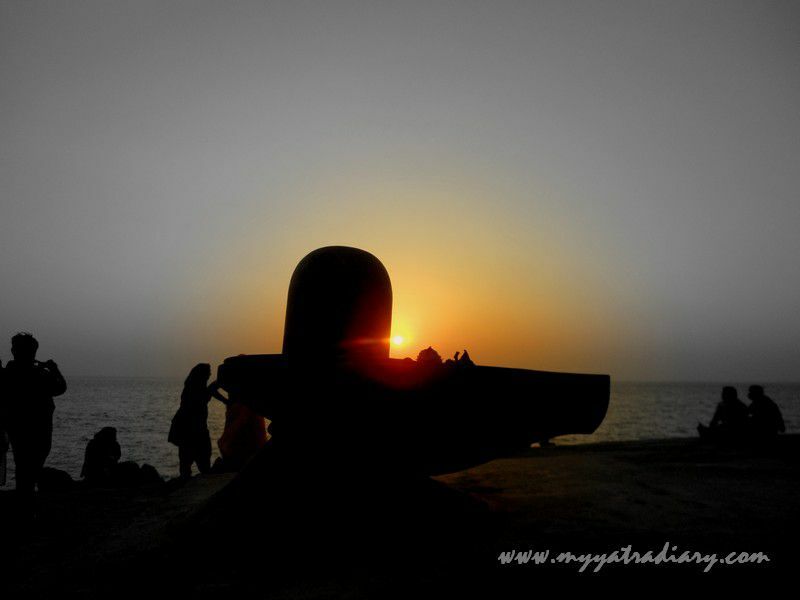 The Shivlingam is believed to around 5000 years old, found at the confluence of Gomati, Ganga and Arabian Sea by Acharya Jagatguru Shankaracharya himself. Though the lingam might be old, the temple itself looks pretty modern in built with tiles printed in religious symbols like Aum and other colorful motifs. A red flag above the temple flutters raucously in the sea breeze complemented naturally by the orange in the sky that has now deepened, giving the evening a lovely flavor. I find for myself a spot, a little away from the crowds to experience the magic of this beautiful hour. The sea is blissfully boisterous, swirling, dancing to the tunes of the wind. A boat crosses my line of vision even as the sun keeps spraying confetti glitter all over the sea. On the left side, far in the distance, is the towering circuit / light house which is now inaccessible to those who wish to see. Somewhere behind is the Gita Mandir (not seen in the picture) and in the front is the sun – which otherwise mighty and strong for the entire day – is now ready to surrender itself to the unseen realms of the infinite. as seen from the rocky outcrop. 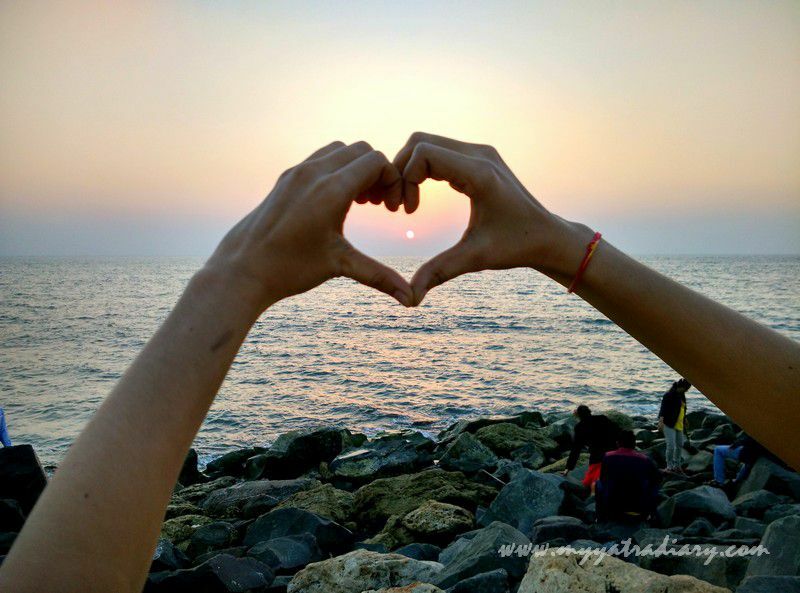 There are people - families and friends, young and old - clicking pictures, taking selfies with the setting sun, with each other and with their own self. While some others stand and stare in quiet contemplation. Even as the light of the sun grows weaker and weaker in the horizon, one can feel warmth all over the place. The warmth is calming. feels nothing short of a miracle. bounties that can never be touched but only be felt with the heart. - The temple gets submerged during high tides while it's open to devotees during the low tides. Hence, I would suggest you to check the high tide / low tide timings before going to the temple. 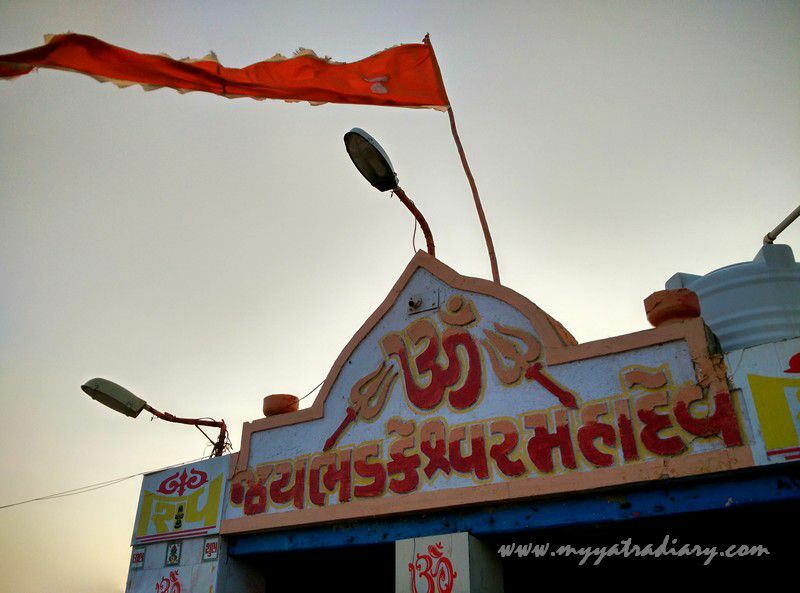 - The temple is near Circuit House, Sunset Point, Dwarka. P.S. I thought of doing this post as the country celebrated Chatth Puja (a centuries old tradition observed over a period of four days, today being the main day), a day when people, mainly from Bihar, parts of Uttar Pradesh, Orissa and Nepal offer their prayers and salutations to the Sun God for providing and sustaining life on earth. Personally, I don’t observe the tradition, so to speak, but I’m always fascinated by the Sunset and the illuminating power of the Sun God Himself. Hence… reminding myself, and you - of the significance and beauty of all the various sunsets in our lives. Thank you for yet another wonderful journey to a place I can only dream of. Wonderful words and photos that bring it to life, thank you as always for sharing. Nice photo and great narration. Beautiful captures, I love sunsets too. Nice to know about such a beautiful place. Very well written yatra post,👍 Arti. 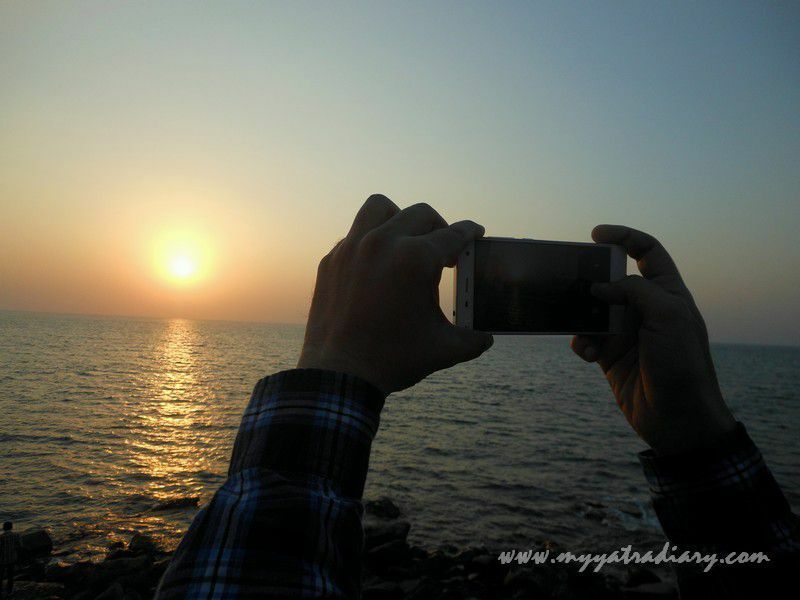 I liked all pics captured by you. The best one is the featured photo. It looks to be a perfect capture. Thanks for sharing. Just like you have mentioned, sunsets just have that power, they are calming, no matter how eventful or awfully tiring your day has been. 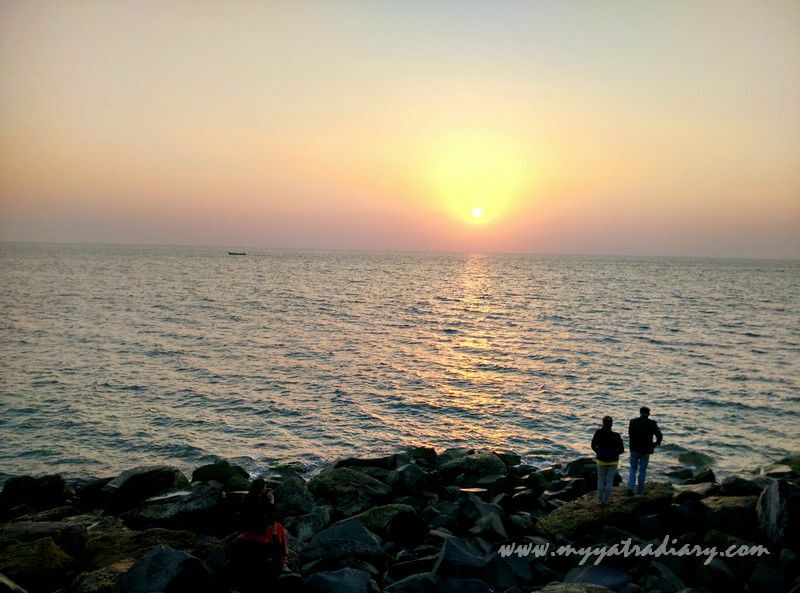 Dwarka itself has that effect on people, and to add to it a peaceful sunset by the sea - why wouldn't anyone feel connected to god here! I have been to this temple in 2011. Visited with parents and grand-parents and relived each moment with your post again. Scenic captures. Shiva Lingam is 5000 years old - just amazing and so proud to know that our culture is so historic and ancient! i love to visit this kind of mythical places and take important information from these places. 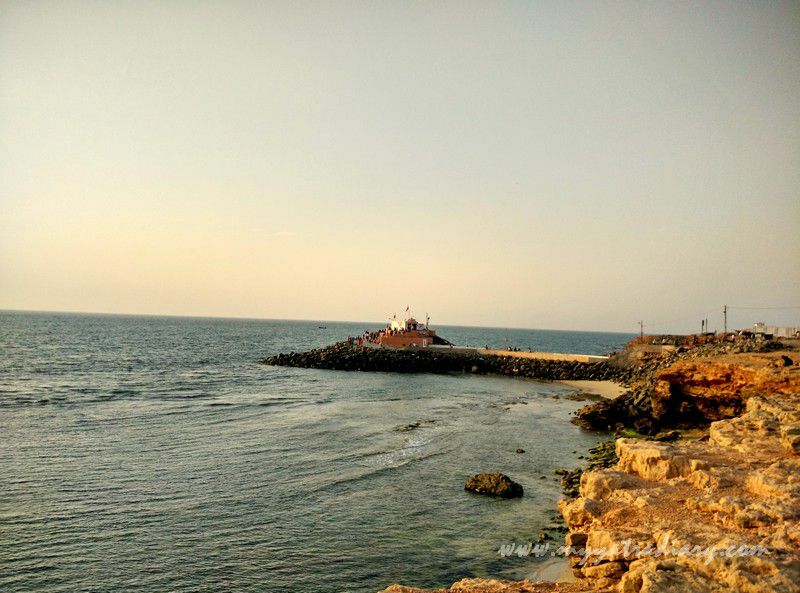 Dwarka is a beautiful and religious place, I have never been there but I would love to go.